In recent years, opinion leaders and government officials have called on government agencies to provide readily available and easily accessible information about the agencies' projects, operations and spending. This emphasis on government "transparency" has led to the publication of an increasing range of useful data on Michigan state government. One state agency, however, has bucked this trend: the Michigan Economic Growth Authority. MEGA is a state "economic development" program run by a board of political appointees and authorized by state government to select businesses to receive credits against the Michigan business tax in exchange for creating or retaining company jobs that allegedly would not exist otherwise. MEGA was established in 1995, and in its early years, the program produced reasonably detailed data on the businesses selected for the tax credits, the jobs created, the total business incentives provided and so on. In the past few years, however, the information contained in MEGA's various reports has become increasingly vague and incomplete. The total value of MEGA business-tax credits awarded each year to each project is now unavailable, for instance, while the value of any MEGA-related local government business incentives has often been left out of the reports. These and other omissions have made it increasingly difficult to measure MEGA's cost and effectiveness. 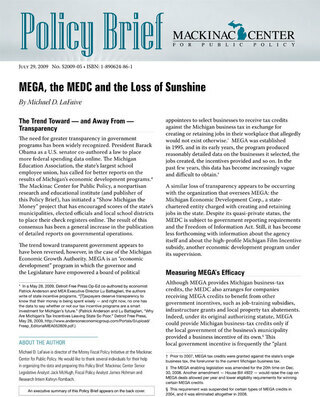 This failure in government transparency is ultimately the responsibility of the Michigan Economic Development Corp., a state-chartered entity charged with creating and retaining jobs in the state and with administering the MEGA program. The corporation is subject to government reporting requirements and the Freedom of Information Act. It is therefore particularly troubling that obtaining explanations of MEGA's various project reports — including an annual report to the Michigan Legislature required by state statute — can require a detailed knowledge of the program's inner workings and weeks of e-mail exchanges and phone calls. A series of basic questions that an MEDC spokesperson encouraged the author to submit remain unanswered more than six weeks after her last e-mail and more than eight weeks since the questions were first submitted. State legislators from both major parties have decried the MEDC's lack of transparency, and the Michigan Office of the Auditor General has criticized the agency in the past for significant inaccuracies in its reports and for its failure to verify key data. Unsurprisingly, at least one bill currently in the Michigan Legislature would require the MEDC to provide greater disclosure. Tracking the progress of the MEDC and of MEGA, the state's highest-profile targeted "jobs program," is particularly important in light of Michigan's economic performance during the last decade. Michigan was ranked 16th among the 50 states in per-capita state GDP in 1999, the year the MEDC was formed and began to administer MEGA; since then, the state has tumbled to 41st. Against this backdrop, state policymakers will need to address MEGA's growing lack of transparency — or consider ending the program altogether.